A lady from Rochdale contacted us with what she had thought was irreparable damage to the Quarry tiles surrounding her brick fireplace. They used to have a lovely glossy finish but due to small accident with candle wax that happened whilst removing the candle the were now dull and patchy. The fireplace and tiles were 17 years old and as far as the customer was aware, they had never been sealed in the past. Unsure of how to resolve the problem they decided to give Tile Doctor a call. As it turns out they had also called their insurance company and were considering replacing the whole fireplace if no one could help resolve it! But the brick fireplace suited the design of the house which also had lovely wooden beams in the same room so that was not their first choice. They certainly did not want the disruption of replacing it. I went over to survey the tiles and carried out a small patch test, the test went well, and I was confident that the tiles could be restored to their former glory! Happy and relieved with the results the customer booked me in to complete the work. 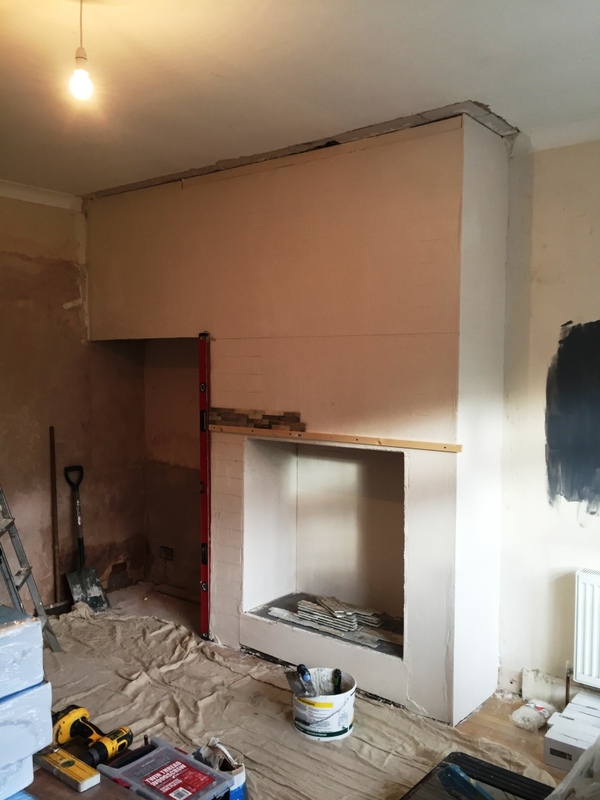 First, we ensured the area around the fireplace was covered and taped up, to ensure no spills onto the nearby carpet and surrounding area. To clean the quarry tiles and remove the candle wax I applied undiluted Tile Doctor Remove and Go which was left to dwell for fifteen minutes before being scrubbed in. The space around the fireplace was tight so to scrub the product into the tile I used a small six-inch black scrubbing pad fitted to a hand buffer. 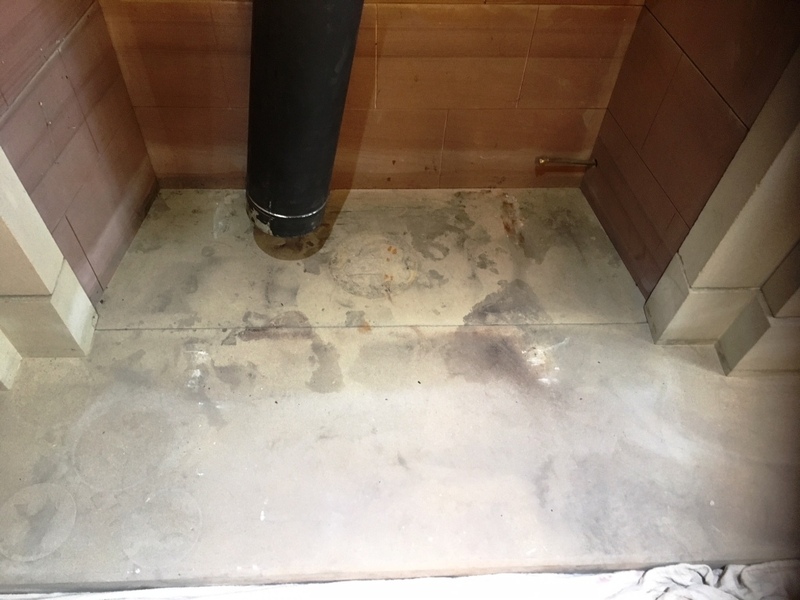 The soil was extracted with our wet vacuum and then the tiles rinsed with water to ensure the mess was kept to a minimum. Normally I would wait for the tiles to dry naturally overnight before sealing, however given the small size of the area involved I was able to dry it using some gentle warmth from a heat gun. This meant I would be able to complete the job in the same day thus saving time and expense for the customer. To seal the Quarry tiles, I applied a couple of coats of Tile Doctor Seal and Go, which gives a nice durable low sheen that works well on Quarry tiles. Seal and Go is also water based so it doesn’t give off a smell as it dries. My customer was very happy with the results which were astonishing! “It’s like having a whole new brick installation ” they explained after we finished! Further they left the following comment on the Tile Doctor feedback system. 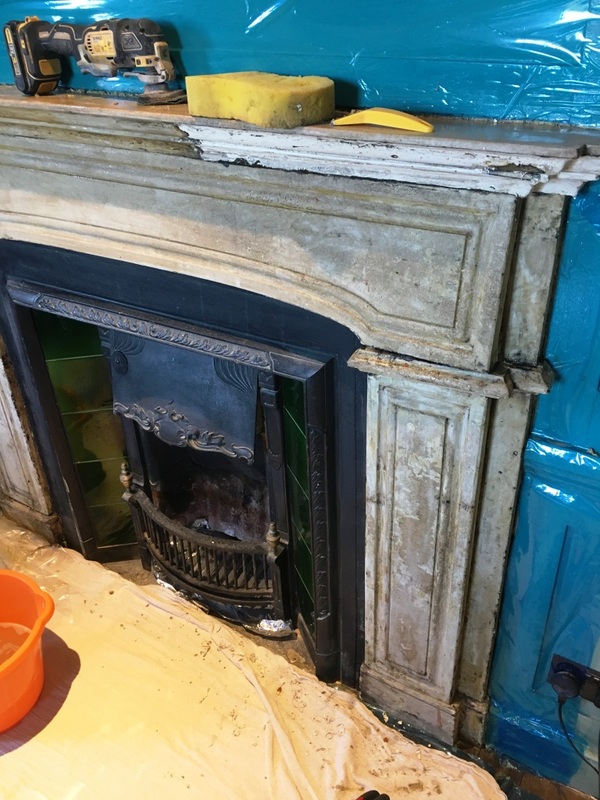 We are often called in to restore stone and tile where others have not been able to succeed, and this was the case with this 200-year-old stone fireplace in Lingfield. To be fair to the previous company its was covered in 5mm of paint in multiple layers so it was no easy task to restore. The church in Lingfield village was apparently rebuilt in 1431 so it’s not surprising to find houses here containing some impressive period features. This property also had an old Pamment tiled hallway which I wrote about in a previous article. 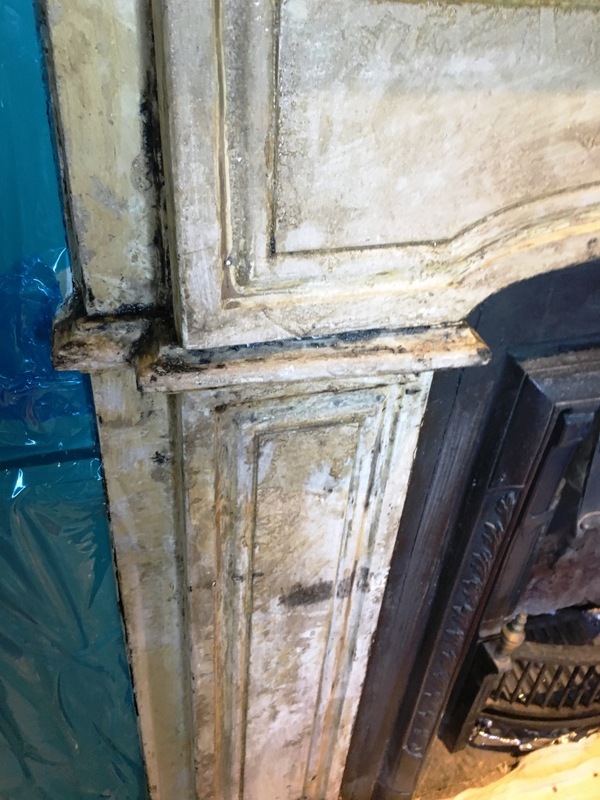 To strip the multiple layers of paint off the stone fireplace I would need to apply a strong chemical, so my first task was to protect the adjacent woodwork. I tend to use a thin blue film for this as it sticks well to most surfaces and like professional decorators masking tape it doesn’t remove the paint when you remove it later. To soften and remove the paint I applied a special paste that is brushed on and slowly emulsifies the paint so it can be easily peeled off. To ensure all the layers could be removed I blanketed the whole fireplace in a thin laminated membrane which ensures the product doesn’t evaporate. The paste is safe to use on Stone and I left it for a couple of days before returning. 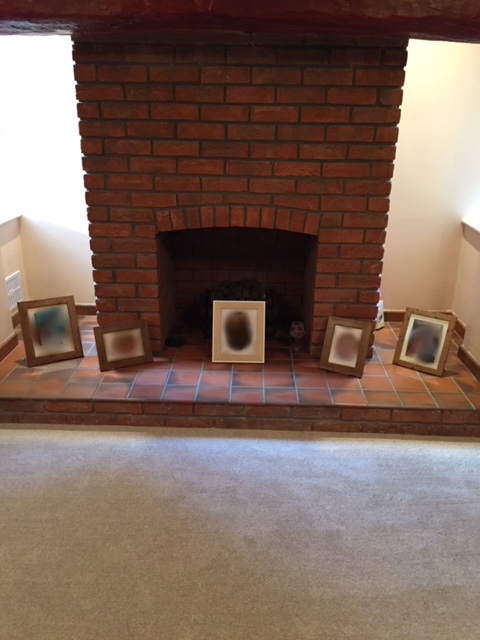 I returned to the house in Lingfield and completed the messy job of stripping off the now pliable paint taking care not to damage the fireplace or the surroundings. Once done and the waste removed, I set about cleaning up the now naked stone with Tile Doctor Acid Gel. Acid Gel is a perfect choice for this job as being a gel its easy to control and sticks to the vertical surface allowing it to be scrubbed in without running down the facia. After scrubbing the gel was carefully rinsed off with a sponge. The restoration took a lot of manual work especially when working around the intricate carvings in the stone however the transformation was well worth it. I think you will agree the Fireplace now looks transformed. The UK has been experiencing an increasing amount of rain over the last few years and this has resulted in quite a few areas being flooded. One of those areas is the old city of Chelmsford in the middle of Essex which is prone to flooding due to the rivers Cam and Chelmer that run through the town. I was asked to visit a property in the town that had been flooded over winter and the red dye in the carpet that was lying on the floor adjacent to their lovely Limestone Fireplace had stained the hearth in several places but primarily around the edges. The fire place had never been sealed and because of this the stone had sucked up the flood water like a sponge. They had drying equipment installed and as the moisture evaporated the red staining became more and more evident. Since then several companies had been to try and remedy the problem and each one was unsuccessful. The couple contacted us, and we went to assess the problem fully equipped to carry out the work. Had the Fireplace been sealed we our first task would have been to remove to ensure we would have no issues sealing the fireplace later. In this case however that wasn’t an issue, so we were able to move straight onto cleaning up the stone using a set of diamond encrusted hand-held burnishing blocks. We started with the coarsest block (50 grit) and rubbed the stone with a bit of added water as lubrication, before wet vacuuming away the excess residue. This process was then repeated with progressively finer blocks (100, 200 and 400 grit), and the hearths were given a final rinse with fresh water. 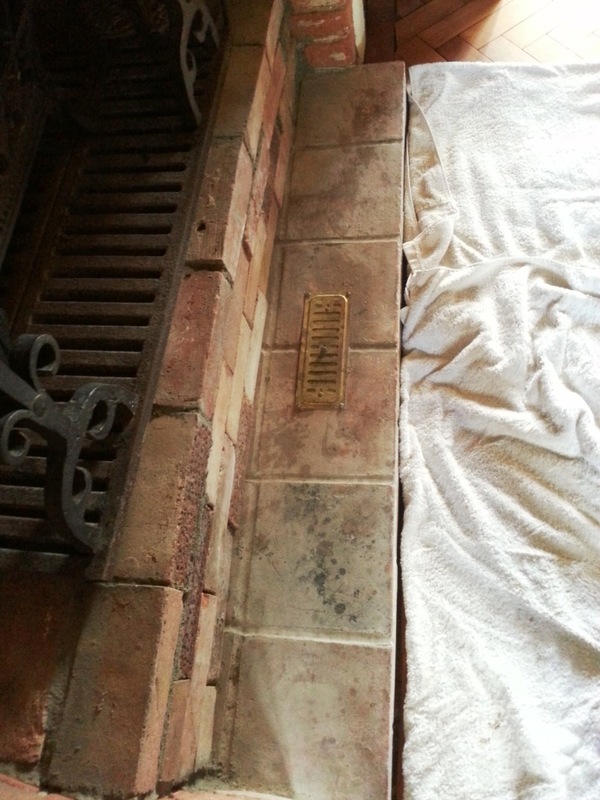 The burnishing blocks are excellent tools to remove scratches and marks from tile and stone and did a good job of removing the red dye from around the hearth. They also took care of some marks that had appeared where the owner had placed a couple of slate tiles on the flat part of the hearth. Along with these marks were some corrosion spots where a metal ornament had been sitting on the hearth for several years. I treated these with Tile Doctor Rust Away which is a specialist product for removing rust stains from tile and stone after a few applications the stain was gone. After we had cleaned the fireplace up to the satisfaction of the client we used a smail dryer to dry everything out so that we could finish the job and seal the fireplace the same day. 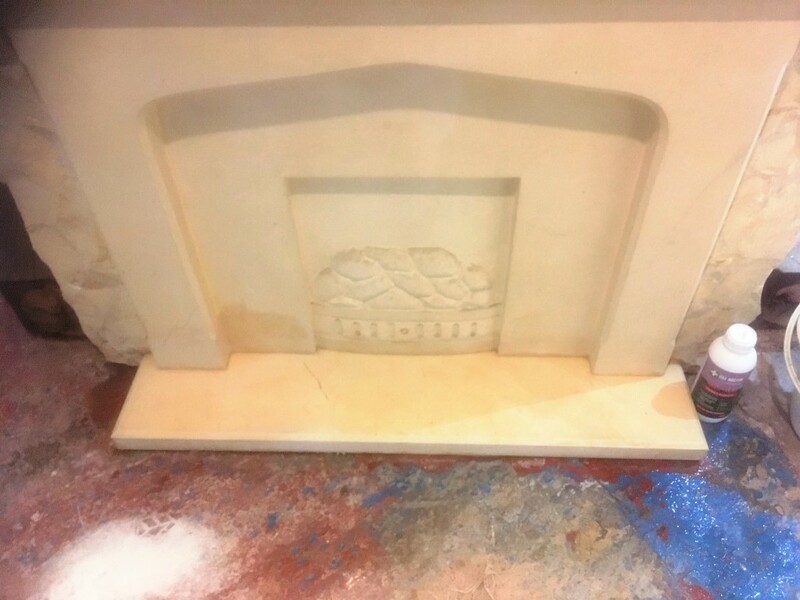 Once the stone moisture levels were at the correct level the Limestone Fireplace was sealed using three coats of Tile doctor Ultra-Seal leaving twenty minutes between coats. Ultra-Seal is a no-sheen product that impregnates the pores of the stone protecting from within without changing the look of the stone thereby leaving it with a natural appearance. I’m please to say our efforts paid off and the Limestone Fireplace and Hearth is now stain free and looking like new. Morecambe is a large town on Morecambe Bay in Lancashire, and is a tourist hotspot within the region – particularly amongst beach goers during the summer. However, due to its location of being right next to the coast and near to the River Lune, Morecambe is an area which is commonly affected by flash flooding. Just last year there were several episodes of severe flooding. This flooding has a big impact on houses and businesses – the damage water can cause can come as quite a surprise if you have not experienced it before. I recently visited to a business in Morecambe which had been affected by flooding. The business was, in fact, a fireplace showroom and a pair of the Limestone fireplace hearths on display had been stained by the water. We were asked to remove the water marks left by the flooding. One of the hearths has been in use as a test model, with a coal burner installed, and it hadn’t been cleaned properly in some time. As you can imagine, there were more problems than just the water stains to overcome! Both hearths would require a deep clean and fresh seal. 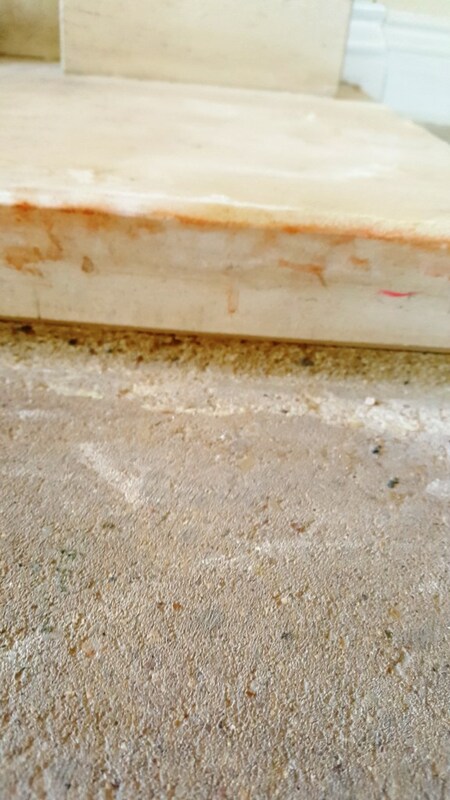 To begin, we applied Tile Doctor Oxy-Gel to the hearths. This product is a specially formulated, alkaline-based degreaser and cleaner. As it comes in a gel form, not a liquid, Oxy Gel can be brushed into vertical surfaces and left to soak, without risk of it either disappearing into the Limestone or, even worse, trickling down the side of the surface. We would not want it coming into contact with the carpet, for instance. We left the Oxy-Gel to dwell for a short period on one hearth while we worked on the other, applying the same treatment. After around twenty-five minutes we rinsed off the gel with clean water and then extracted any excess moisture with the use of a wet vacuum. This process did a good job of cleaning the Limestone, but more work was required to restore its appearance, so the hearths were polished using a set of diamond encrusted hand held burnishing blocks. We started with the coarsest block (50 grit) and rubbed the stone with a bit of added water as lubrication, before wet vacuuming away the excess residue. This process was then repeated with progressively finer blocks (100, 200 and 400 grit), and the hearths were given a final rinse with fresh water. There were some odd ring marks on one of the Limestone hearths that we couldn’t remove. Thankfully, the owner put our minds to rest on this problem, as he said they were there when he initially purchased the stone over 20 years ago. They had been covered with dirt ever since and the customer was surprised, but not shocked, to see them again. I suspect that these marks were caused by the natural mineral deposits within the stone. These should not be seen as a stain, but just a characteristic of the stone – and no amount of cleaning will get these marks out. 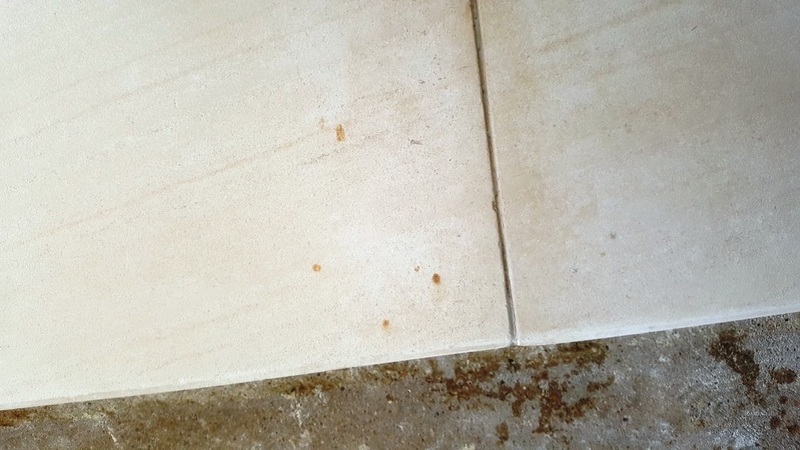 We would normally seal a light-coloured stone like this with Tile Doctor Ultra-Seal, as this no-sheen product helps to retain the natural patina of the stone. Alternatively, if we wanted to darken the tone of the Limestone, we would apply Tile Doctor Colour Grow, which is a colour-intensifying, impregnating sealer. Two coats of either sealer would suffice, in this case despite being very pleased with the results of the cleaning, the customer decided that he wanted to take care of sealing of the stone himself. 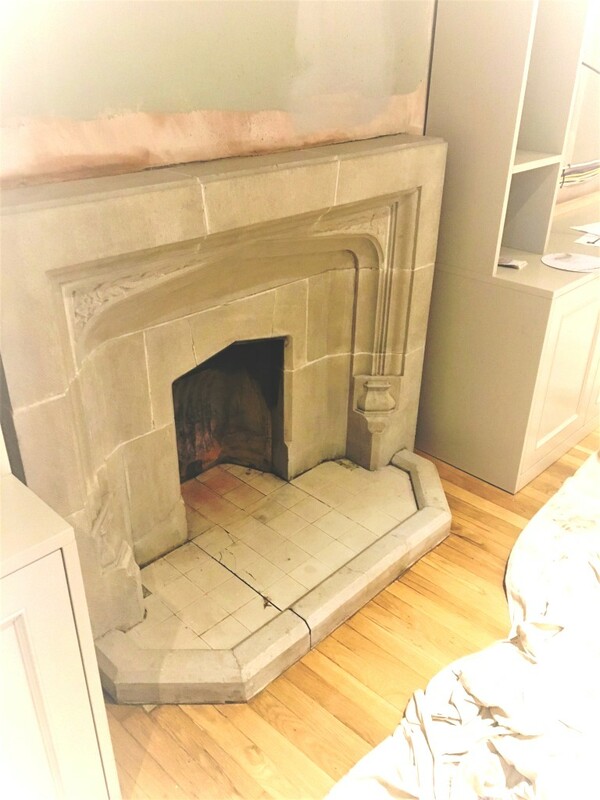 A stone fireplace adds a classic and period look to any home but like the stone floors we deal with its only a matter of time before the appearance degrades, however not from foot traffic but from soot. This process happens so gradually it goes without being noticed until one day you realise it really does need a good clean and the dirtier it gets, the harder it is to clean. 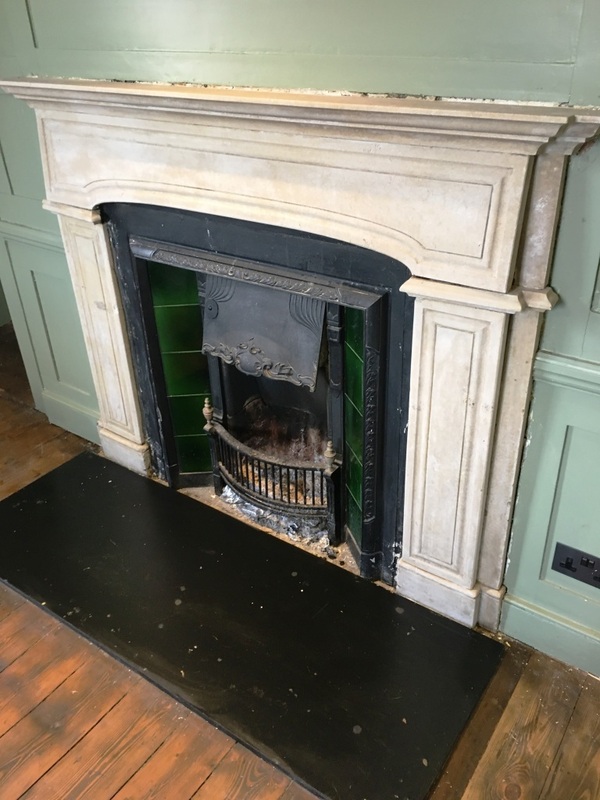 I recently visited a customer living in the historic city of Oxford who had never once cleaned their black Limestone fireplace. One day, they decided to finally clean it but found that it would take a lot more than just a light scrub with some soapy water! As you can see from the photograph below, the Limestone was extremely dirty, dusty and stained. Upon examining the situation, I decided that the best way to restore the stone to its original condition would be to use a polishing process known as burnishing. Keen to see the natural beauty of the Limestone again, the customer was more than happy to book in the job. As I would be focusing solely on the Fireplace, it was necessary for me to start by protecting the surrounding area with tape. I then began the process of burnishing, starting with a 200-grit diamond encrusted handheld burnishing block. I sprayed a small amount of water onto the fireplace to act as a lubricant and rubbed the diamond encrusted block onto the stone. This coarse grit pad helps to grind away the thick layers of dirt on the surface of the Limestone and starts to gradually polish the surface beneath. I completed the burnishing working in small sections at a time, rinsing with fresh water and wiping excess off regularly as I progressed. After finishing with the 200-grit block I then repeated the process using a 400-grit block. This block possesses a finer grit and really helped to achieve a high-quality polished effect. While the Limestone was drying, I treated the black fire grate with the correct grate paste (or polish) which cleaned it and recoloured it. To complete the cleaning process, I paid attention to the black tiles on the floor. These were cleaned using Tile Doctor Pro-Clean diluted with water, and scrubbed into the stone and grout using a small specialised brush. Finally, I rinsed the area with fresh water and dried it with a towel. I then had to leave the fireplace to dry for about an hour so it would be ready to seal. To seal the Limestone, I used Tile Doctor Ultra-Seal, which offers the natural looking finish that the customer wanted. This sealer is formulated to provide maximum protection against stains and dirt, and is suitable for use on all types of natural stone. 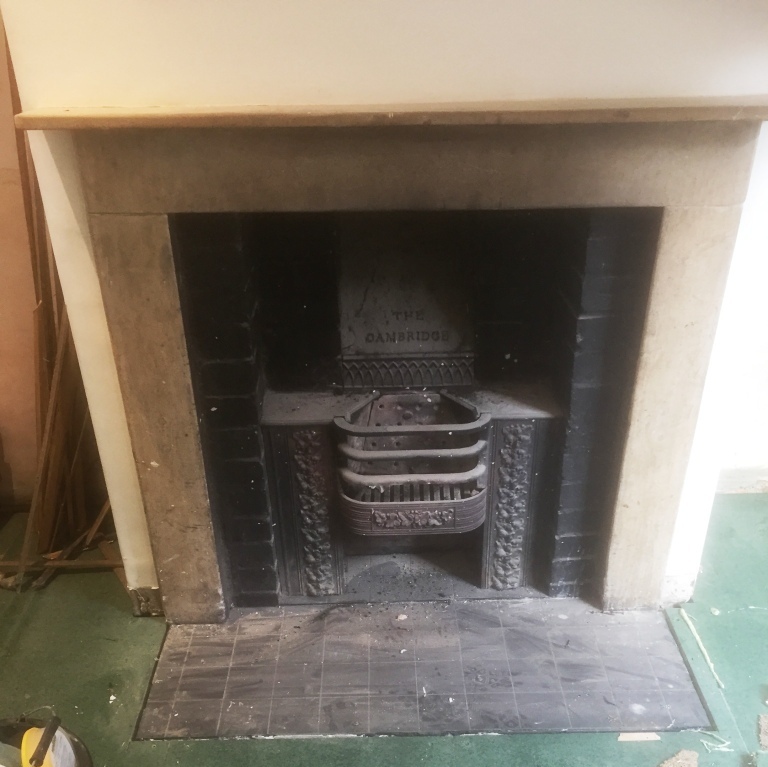 The customer has decided that although this will no longer be used as a working fireplace it, will certainly give the room a focal point – so she was very happy to have it back to looking its best! Here at Tile Doctor we have developed numerous products and techniques for dealing with all types of situations related to the cleaning of stone, tile and grout. 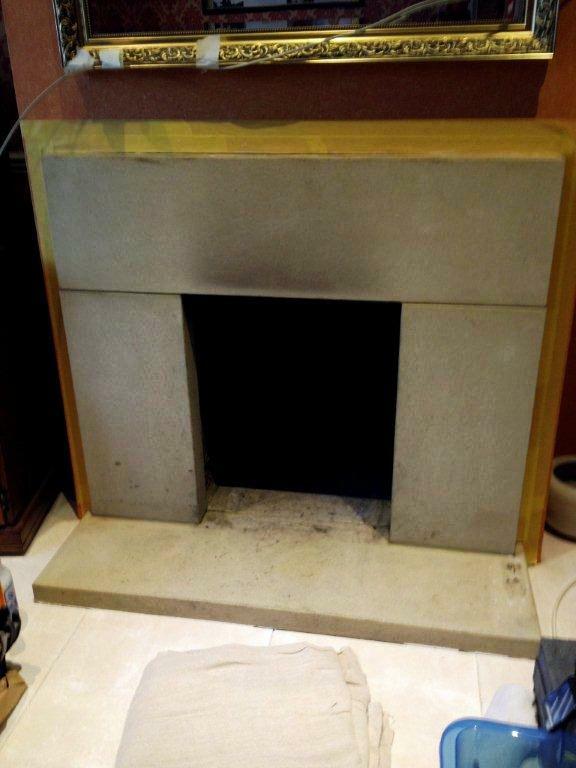 Whilst the most popular work we do relates to the cleaning and sealing of floors sometimes we get asked to resolve more unusual issues such as this Wine Stained Limestone Fireplace at a house in the London commuter town of Woking. Unfortunately for the customer their teenage son had knocked a glass of red wine from the dining table onto the carpet and over his parent’s adjacent limestone fireplace which despite early attention left noticeable dark spots in the stone. The customer was keen to have the stains removed and had even resigned himself to the possibility of replacing the whole fixture. 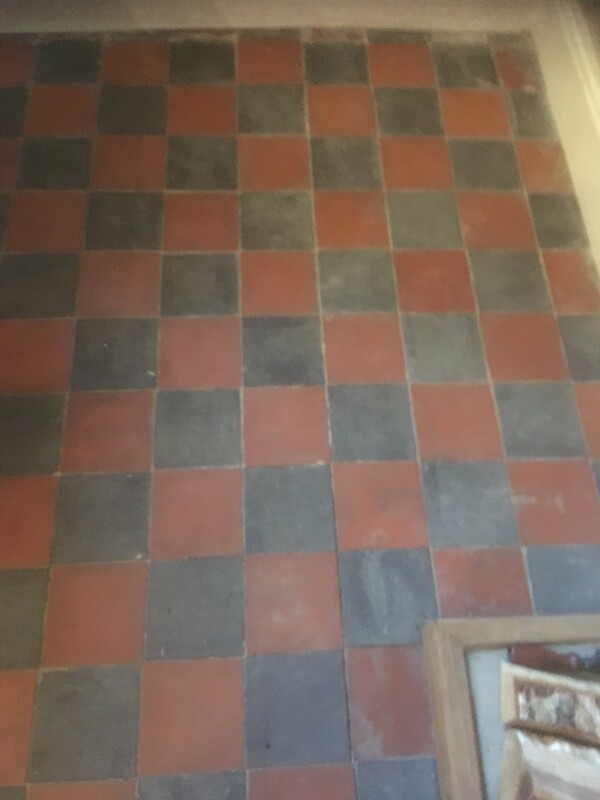 Naturally this would’ve cost hundreds of pounds; fortunately, however he discovered Tile Doctor on the internet and realised the staining could be remedied reasonably easily with the correct knowledge and products. I mentioned earlier Tile Doctor have developed numerous products and techniques and this includes Tile Doctor Reduxa which is designed to lift the stains out of stone, so I decided to try that first. My method of application was to spray the stain with Reduxa and leave it to soak into the stone for about twenty seconds. Then I worked the solution into the surface of the stain lightly using a smooth 400 grit diamond block. The next step involves using a heat gun to dry out the area. This process is repeated five or six times until the stain completely disappears. The process works by dissolving the stain into the Reduxa which is then evaporated by the heat. I’m really pleased with the transformation I managed to achieve cleaning this Stone Fireplace at a lovely period house in Brighton. The client had been decorating the room which highlighted just how grubby the Stone Fireplace now looked and she desperately wanted to use it for the cold nights towards Christmas. The run up to Christmas is generally a busy time for us as we usually find homeowners are really keen to have their tiles cleaned in time for the festivities. However these jobs tend to only take a day at most so I was confident I could squeeze it in quite quickly. Before starting any job I make sure the surrounding furnishings are protected from splashes from the cleaning products we use. I tend to use a thin blue film for this as it sticks well to most surfaces and like professional decorators masking tape it doesn’t remove the paint when you remove it later. To clean the fireplace I used a diluted combination of Tile Doctor Pro-Clean and Acid Gel which was applied to the stone and left to soak in for few minutes before scrubbing it by hand and then carefully rinsing it off. Pro-Clean is a powerful cleaning product on it’s own but I needed something that would deal with the soot and Acid Gel is able to remove all sorts of deposits plus being a gel it sticks well to vertical surfaces. I couldn’t really use any machinery on the Fireplace that would make the job easier so I had to use a lot of elbow grease instead. The intricate carvings in the stone took some time to get really clean and so in total the job took me about four hours. 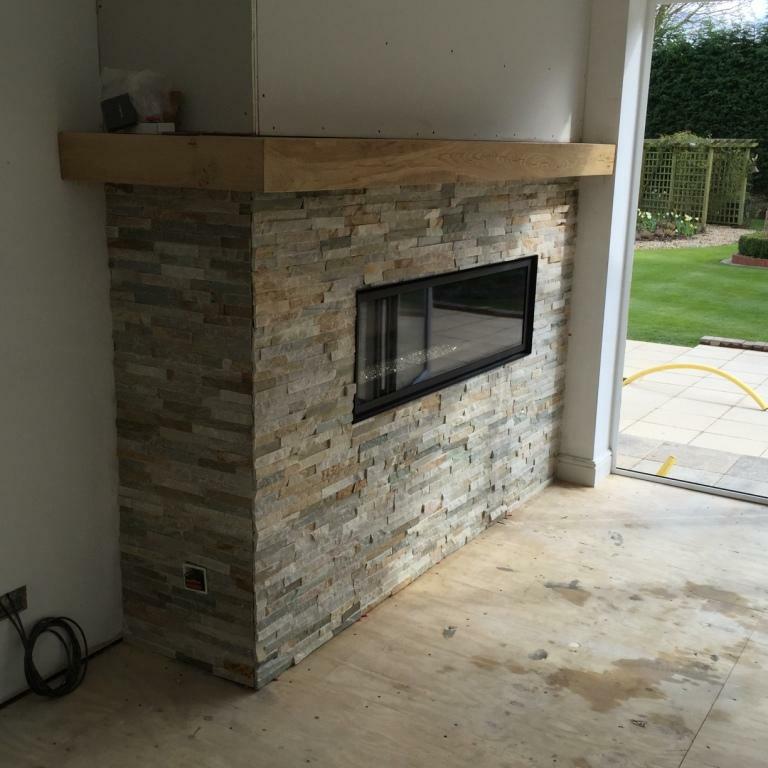 The Stone Fireplace was transformed by the time I had finished and I think you will agree it now looks fantastic. Brighton is a great place to go shopping especially around “The Lanes” behind the main promenade where they have lots of unusual gift shops and with Christmas looming I was able to spend what was left of the afternoon roaming around. 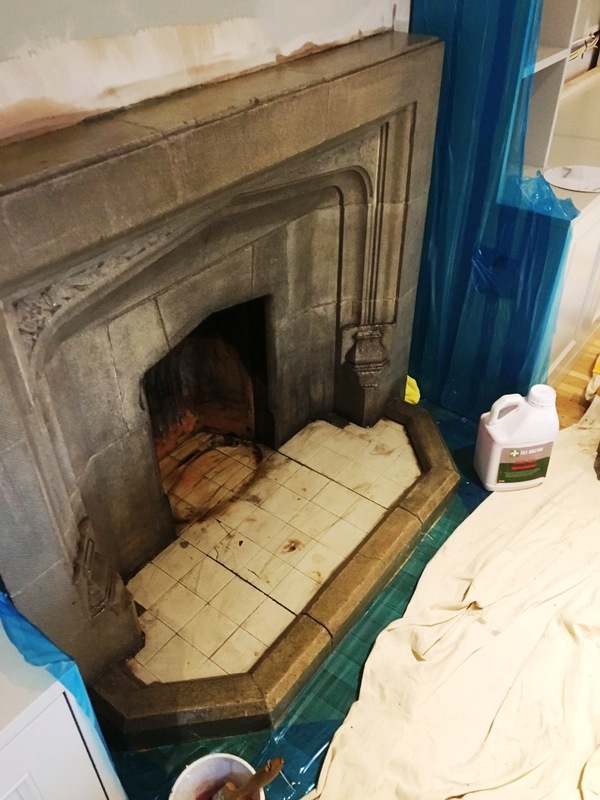 We often get asked to do a combination of jobs at Tile Doctor so we have to be prepared for the unexpected, like getting asked to clean an old Sandstone fireplace whilst your cleaning a Victorian tiled floor at a house in Preston. We normally charge extra for these types of jobs but it depends how much cleaning is required. 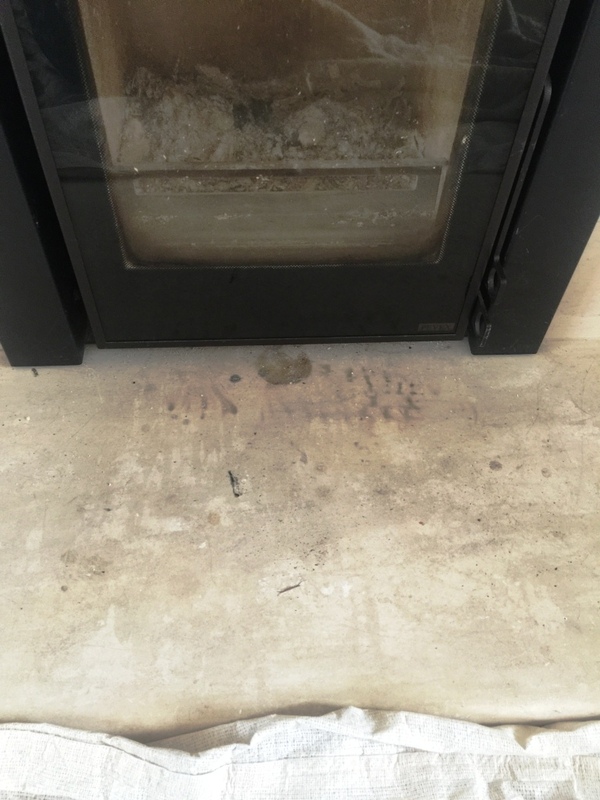 This Fireplace had been in use for a number of years and due to its grainy texture was hard to keep clean, dirt and soot had built up on its surface and there was no sealer visible, either that or it had worn off with the heat. To clean the uprights and Hearth I applied Tile Doctor Oxy-Gel which being in Gel form and not a liquid, stays in place increasing dwell times and doesn’t drip where it shouldn’t. In this case I let it soak into the stone for about forty minutes before scrubbing it in with a stiff hand brush and steam. Some marks were still visible after this process so we opted for using handheld Diamond blocks in 50.100.200 and then 400 grit to grind off the staining and restore the surface finish. Using these small handheld blocks takes off some of the heavier texture as well as cleaning the stone at the same time, but is really useful to use where chemicals alone struggle to get the results required. 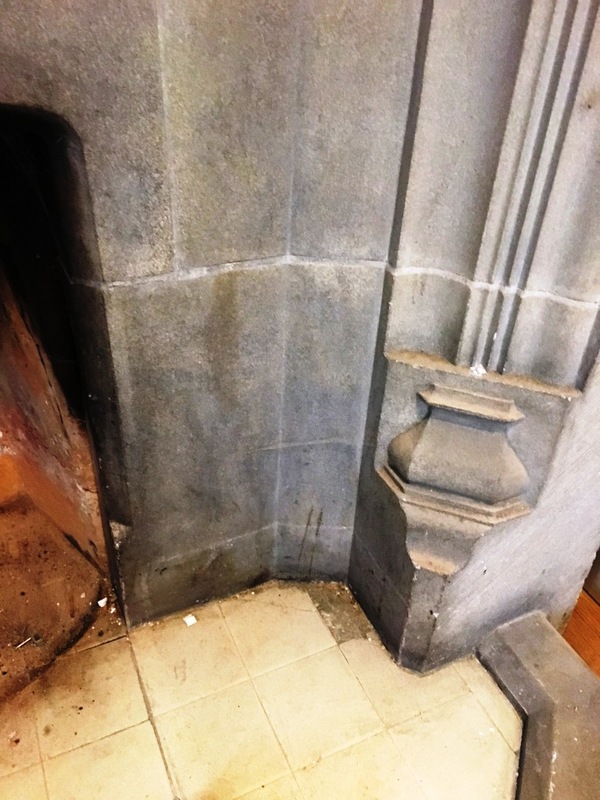 Once fully clean the fireplace was rinsed with water a couple of times and the slurry removed using a wet vacuum. After speed drying the stone with a heat gun it was ready for a couple of coats of Tile Doctor Colour Grow, even we were impressed with the results. 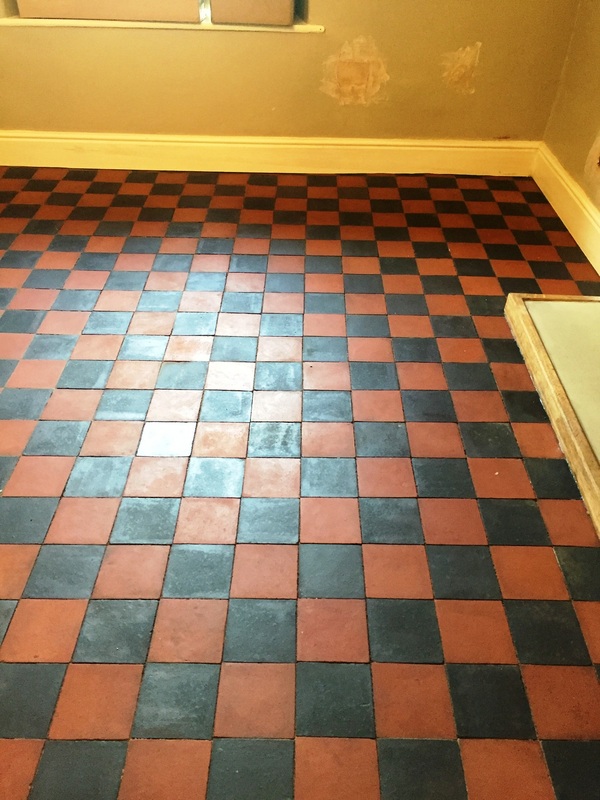 The Red and Black Victorian Tiles were cleaned with a strong dilution of Tile Doctor Pro-Clean which is very similar to Oxy-Gel only in a liquid form. The product was left to soak into the tiles for about ten minutes before being scrubbed in with a black buffing pad attached to a slow speed buffing machine. I used the wet vacuum again to soak up the residue and stubborn stains were retreated until I was satisfied. 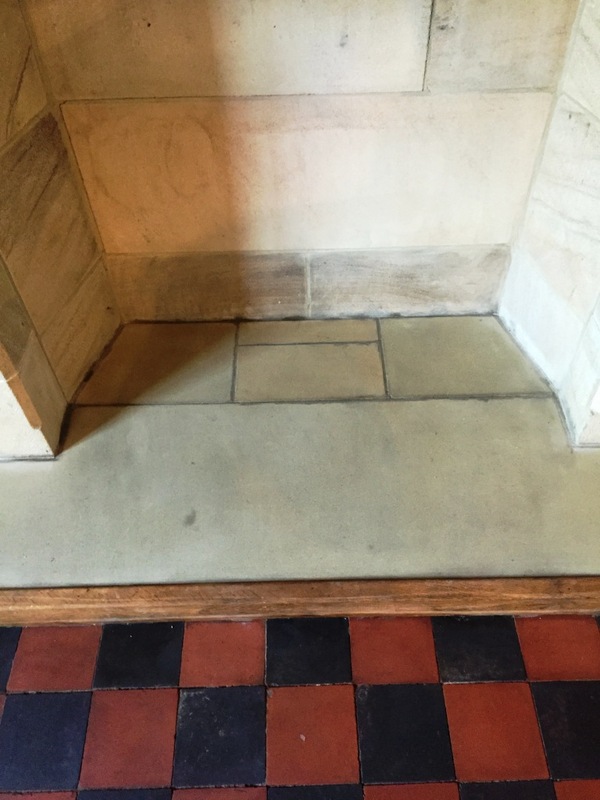 Old Victorian floors rarely have a damp proof membrane installed and so it’s not uncommon for damp to rise-up through the ground and tile resulting in white salt deposits being left on the surface. 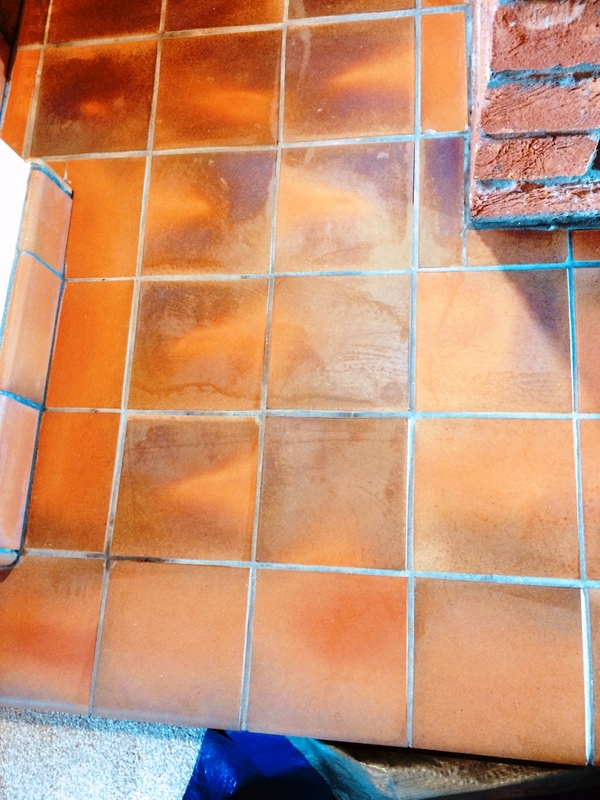 To prevent this process, which is commonly referred to as Efflorescence, Tile Doctor Acid Gel was applied. The solution is scrubbed into the tiles and then rinsed off with clean water and removed with a wet vacuum ready for sealing. Victorian Tiles can take a while to dry and in this case I left it two days before returning to apply a breathable sealer to protect the tiles from ingrained dirt and staining. In this case a couple of coats of Tile Doctor Colour Grow were applied. If you recall this was the same sealer we used on the fireplace as the customer wished to bring out the colour and have a Matt finish. As you may know already, Tile Doctor aren’t limited to the maintenance and restoration of tiled floors. Our expertise covers all different types of tile and stone cleaning, meaning we are even able to clean and restore stone fireplaces. 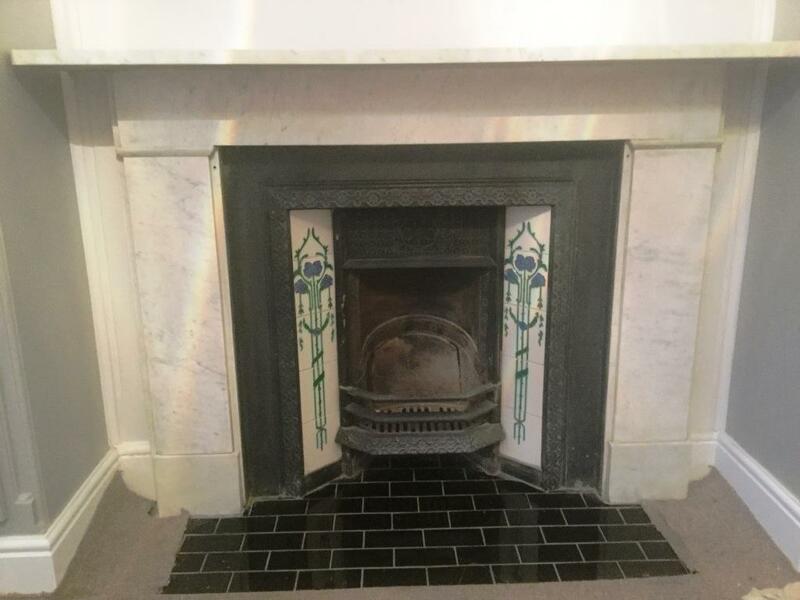 A good example of this is a polished Marble fireplace I recently restored in Bedford, which is the county town of one of England’s smallest counties, Bedfordshire. Marble is reputed in the international market for its premium quality, toughness, and durability, making it a great choice for a fireplace – if you can keep it properly maintained! 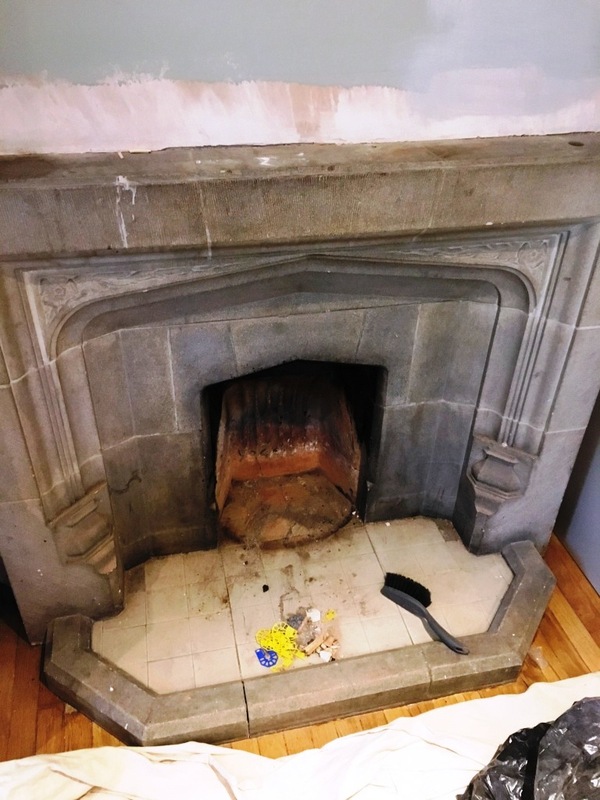 The following pictures show the state of the fireplace before the restoration. As you can see, the stone was stained and discoloured, possibly from smoke damage as it had previously been used as an open fire. My task was to get the Marble back to looking its best again through a combination of polishing and sealing. Here’s how I did it. 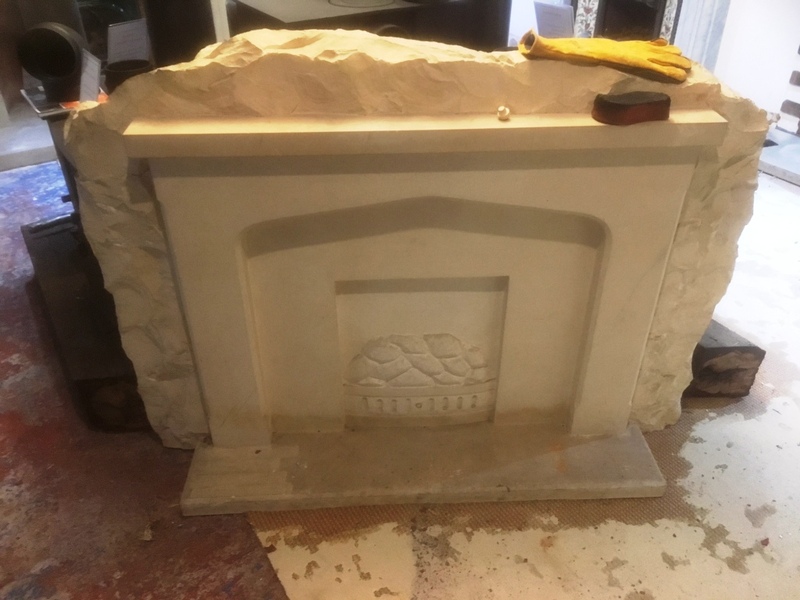 The process I took to restore the fireplace is much the same as the one I would for tiled floor polishing except on a smaller scale and with smaller tools. Cleaning a vertical surface can be trickier and make a bit more of a mess with possible splashes, so I fully sheeted up the area, covering the customer’s furniture and newly decorated walls. It involved the application of six inch diamond encrusted polishing pads of varying grits, fitted to a handheld machine, as well as handheld diamond encrusted blocks to get into all small, difficult to reach areas. Just like with tiled floor polishing, I started with a Coarse grit pad to grind away the tough stains and then worked my way through the system of different grades of pads until finishing with a very fine pad to refine the polished finish. Once the fireplace had been polished to a high standard, I sealed the stone using Tile Doctor Ultra Seal, which is a premium, no-sheen, natural-look, solvent-based penetrating sealer formulated to provide maximum stain protection. It’s perfect for high-end natural stone like Marble, it can also be used on Granite, Slate, Travertine, and Limestone to achieve a high shine finish and protect the stone. By the time, I had finished it was starting to get dark, so unfortunately the photo below, which shows the result, does not show off the quality of the shine that I was able to achieve on the Marble. Nevertheless, the customer was very happy with the results. 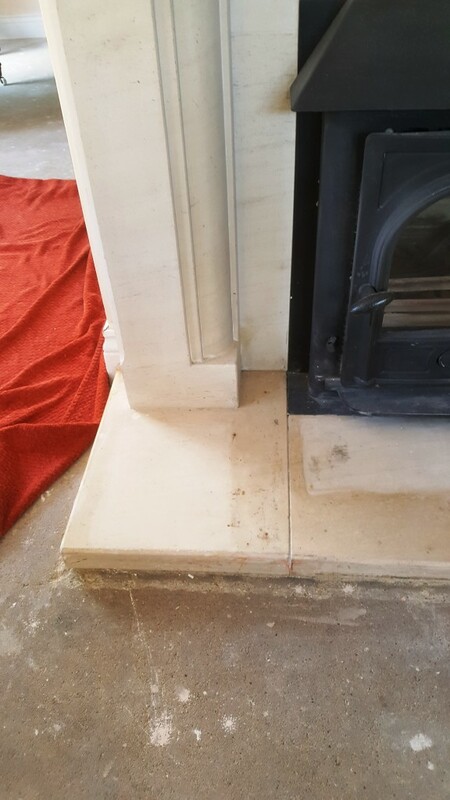 This is a follow-on post from the Travertine Kitchen floor that I wrote about recently, you may recall the customer from East Byfleetalso asked me to clean the stains from the hearth of their Natural Stone Fireplace as well. 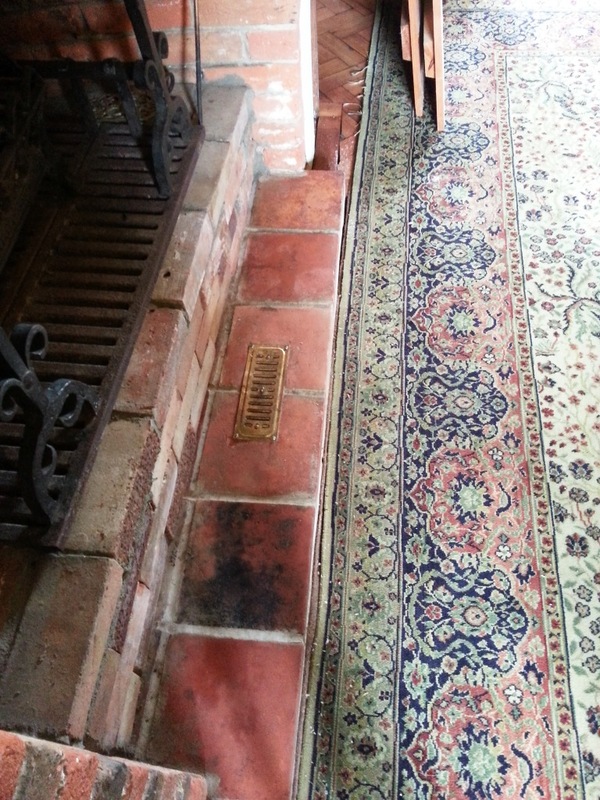 The fireplace was suffering from general dirt build-up as well as bad rust and oil stains. 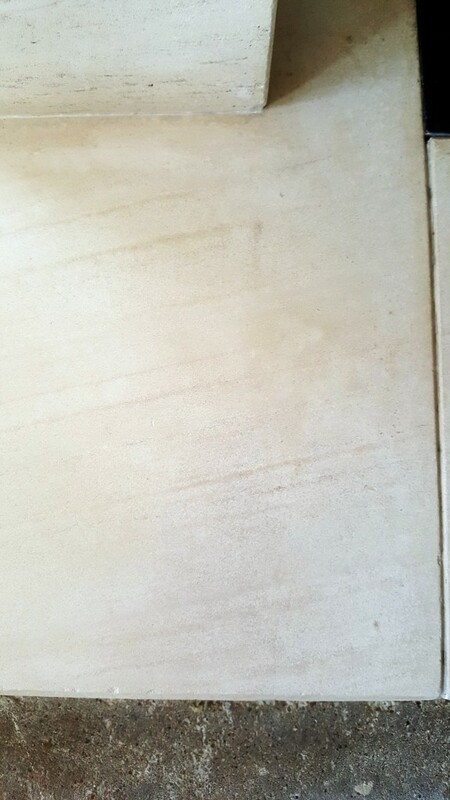 I treated the rust stains using Tile Doctor Rust Remover which is a specialist product developed by Tile Doctor especially for the removal of rust marks from stone. Then to deal with the oil stains I applied a solution of Tile Doctor Pro Clean alkaline cleaner combined 50/50 with Tile Doctor NanoTech HBU to give the solution extra strength. While this improved the condition of the stone and removed the un-sightly stains more work was required so I continued the cleaning process with the application of a Coarse 30 grit pad fitted to my hand machine. 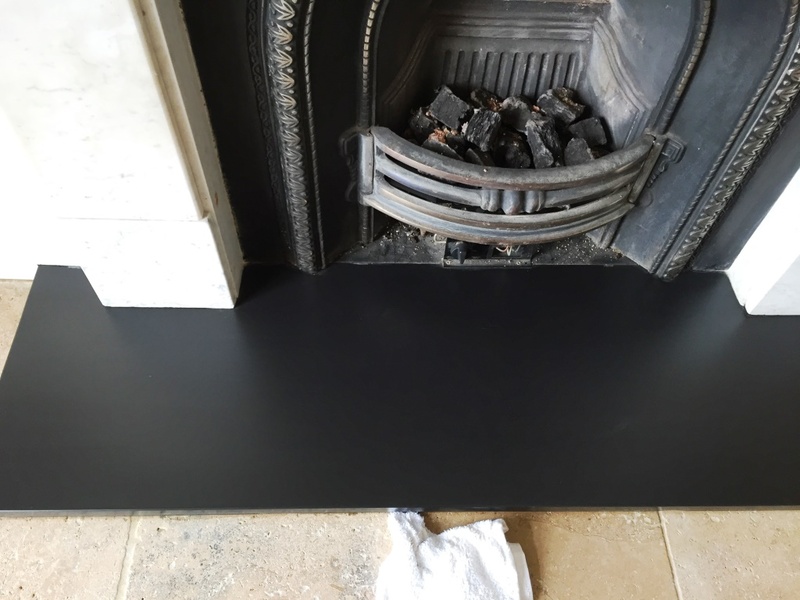 This proved effective, so I then refined the surface further using a series of fine grit pads before sealing the fireplace with Tile Doctor Ultra Seal, another of our impregnating sealers. The appearances of both Travertine tiled kitchen floor and the natural stone fireplace have benefitted greatly from deep cleaning, high quality polishing, and a fresh seal. Much to the delight of my customer, they will prove much easier to keep clean I’m the future. 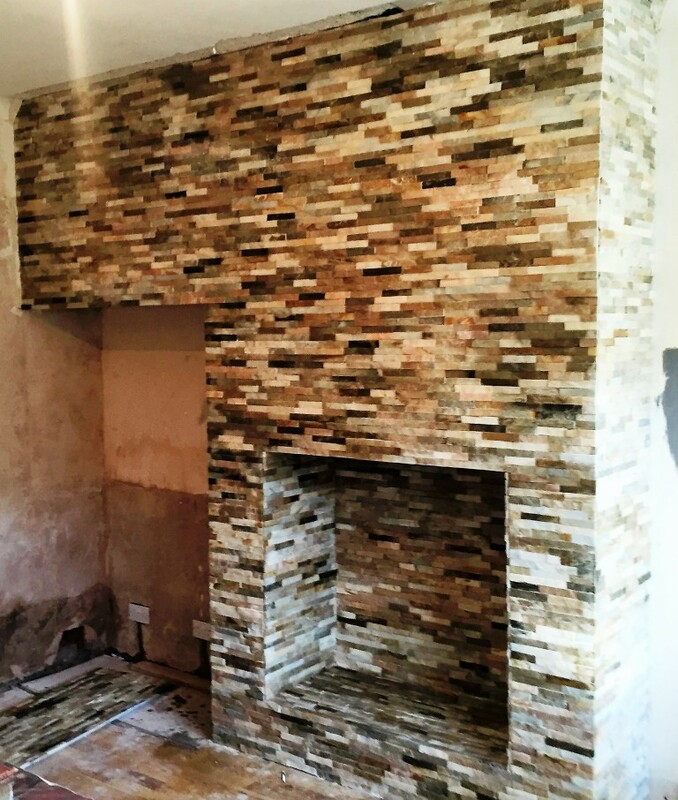 The owner of this property in Wawne Village was keen to have their electric fireplace – which was built into the wall – spruced up with some patterned tiles. While at Tile Doctor we most often focus on cleaning and sealing tiles many of the team such as myself are fully trained tilers we are also carry out full installations where requested. 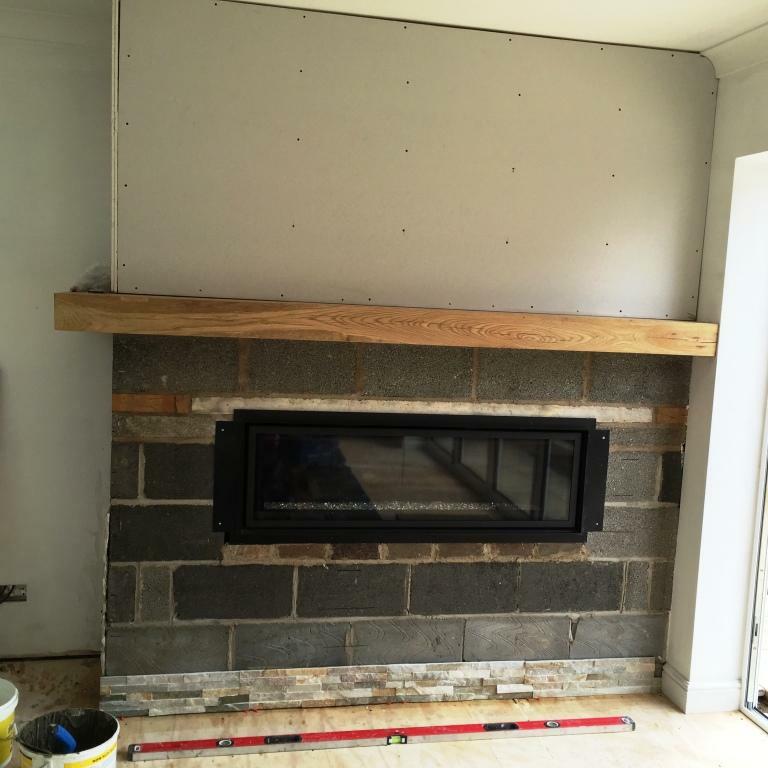 I suggested that the fireplace would look fantastic if tiled with the Oyster Slate and you may recall I did a similar fireplace in Hull which worked out really well. 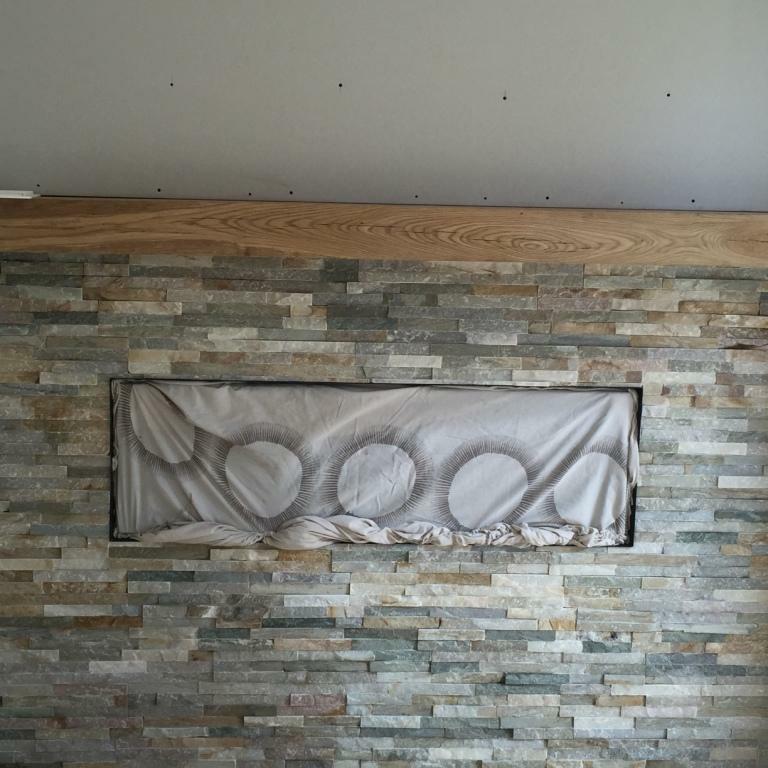 Oyster Slate is a natural stone that is especially well suited for giving feature walls, such as this built in fireplace, a really distinct, elegant look. My customer agreed with the suggestion, and I travelled up to the property to complete the work. Upon arriving at the property I spent a number of hours carefully fixing the Oyster Slate tiles and then grouting. Although the installation was new and looking very nice, it was necessary following installation to clean and seal the area, especially given the amount of loose dust particles and other general muck created in the process of cutting the tiles. To clean the slate and grout I used a dilution of Tile Doctor Pro Clean, our versatile alkaline cleaner. The great thing about this product is that it can be used to achieve reliable results on almost any kind of natural stone, from Victorian and Slate, to Limestone and Marble. Once clean, the area was left to dry completely. As most tiled floor owners will already know, the drying phase is very important as even the smallest quantity of excess moisture left on the tiles can cloud any sealer you choose to use. When I was satisfied that the tiles were dry and therefore ready to be sealed, I applied two coats of Tile Doctor Ultra Seal, which is our premium, natural look penetrating sealer formulated to provide maximum protection against dirt and stains. Both myself and my customer were very pleased with the results. 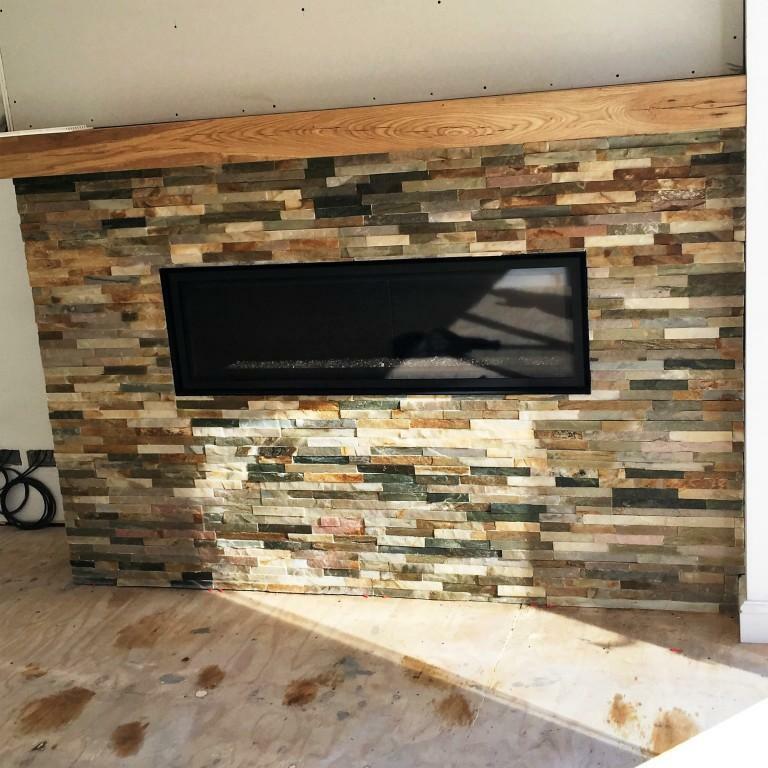 The addition of the Oyster Slate tiles have taken the fireplace from being a relatively uninteresting feature to one that really stands out and adds character to the room. With a deep clean and fresh seal, it will also be easy for the customer to keep it looking fantastic in the future. While at Tile Doctor we are more often than not asked to carry out professional maintenance for existing tiling installation we have also been known to do the installation as well. 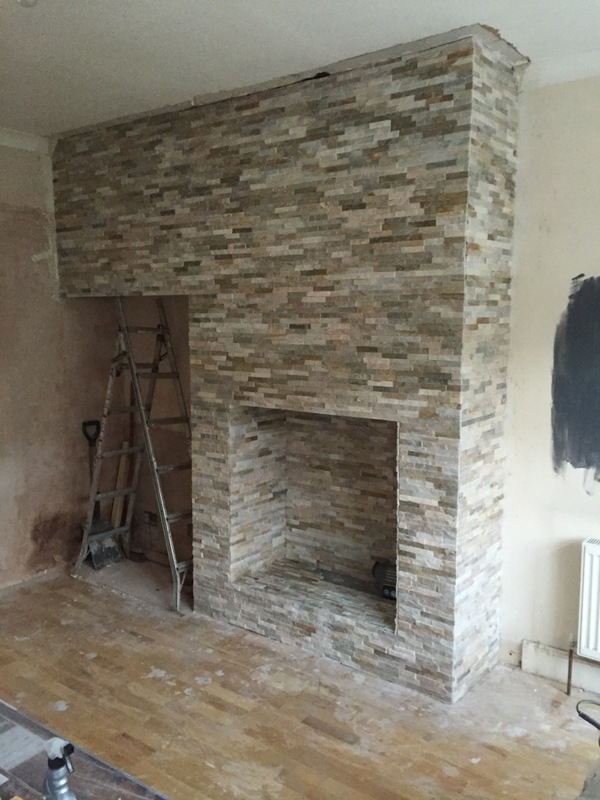 This was the case with this customer, living at a property in Hull, who contacted me about a full tile installation on their fireplace, situated in a living room which itself was undergoing some redecoration. I recommended an Oyster Slate tile, a natural stone which contains a nice range of black, brown and white shades to give walled areas a really distinct look. 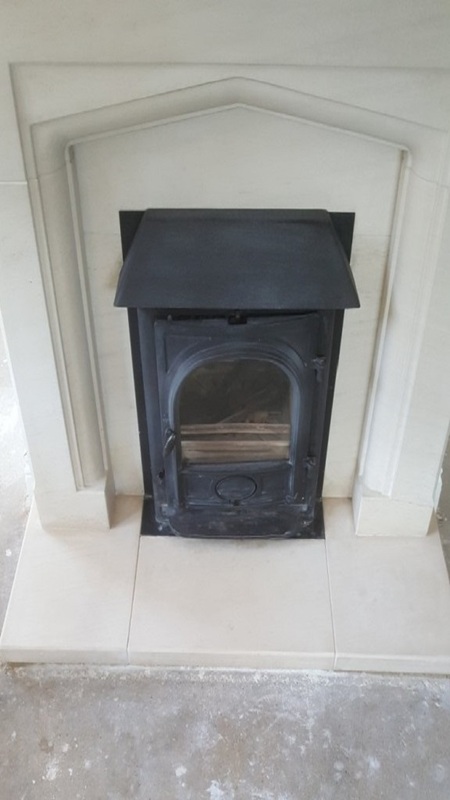 I explained to my customer – who was very happy with the choice of tile – that the fireplace would have be cleaned and sealed once the Slate tiles had been installed. 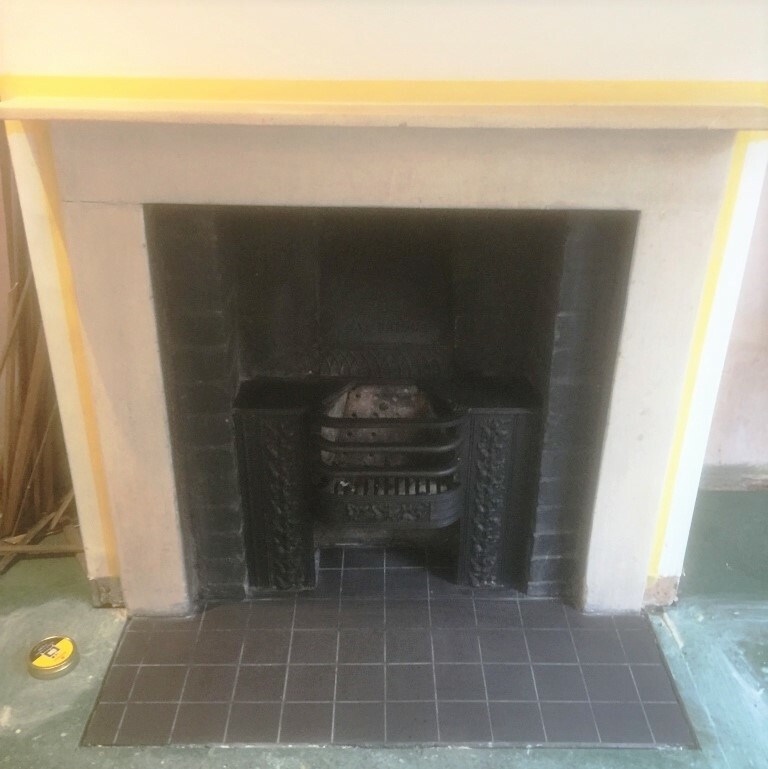 This customer planned on having a coal fire installed following the tiling, but without a robust seal the Slate would be blackened by the coal and become difficult to clean. 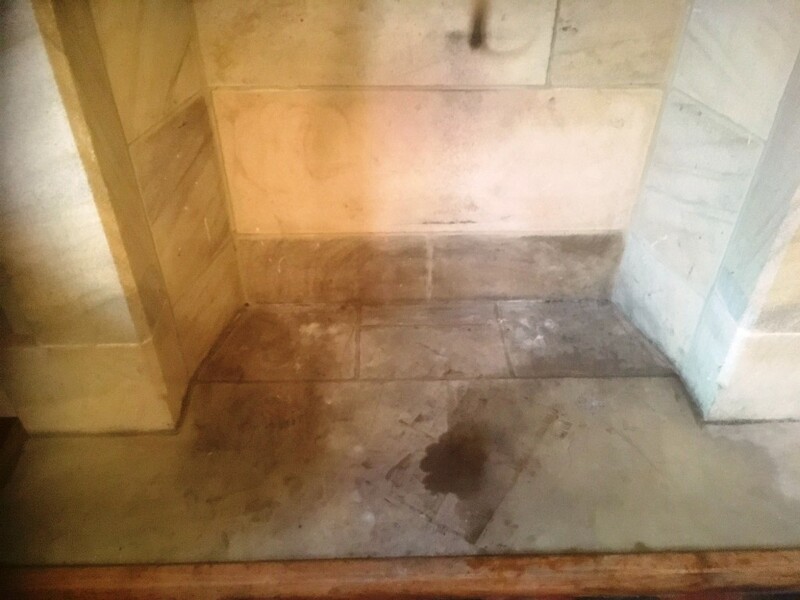 Once I had successfully tiled the fireplace with the new Oyster Slate, I set about cleaning the area with an application of Tile Doctor’s versatile alkaline-based cleaner, Pro Clean. 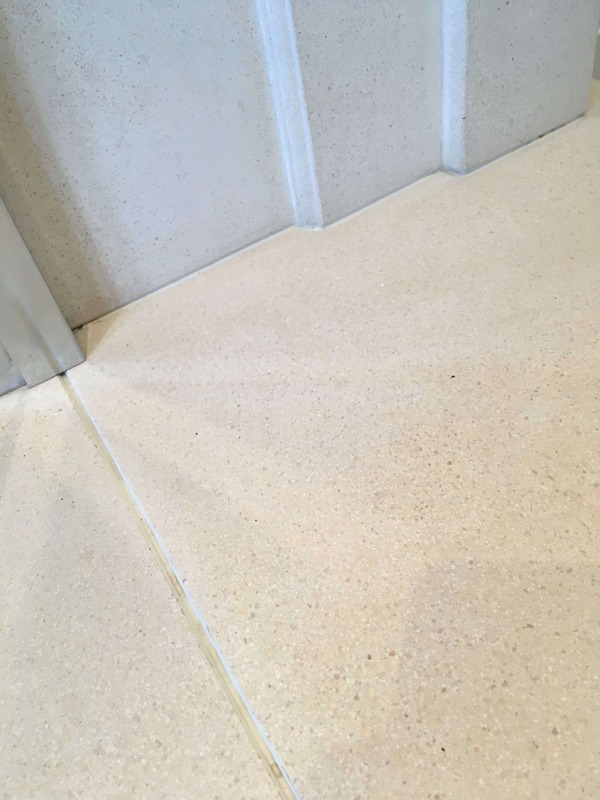 The tiles were caked with debris and dust from the tile installation, but Pro Clean – which is suitable for use on most types of natural stone tile – quickly cut through the layers of dirt and left the area looking perfectly clean and ready to be sealed. My choice of sealer was Tile Doctor Ultra Seal, an impregnating sealer which soaks into and fills the pores of the Slate, thus preventing dirt – such as debris from a coal fire – from becoming ingrained in the stone. Ingrained dirt can make tiles notoriously difficult to clean, so it’s always recommended that you have use a suitable sealer – and keep it topped up – to make your life easier when maintaining the appearance of your tiles in future. 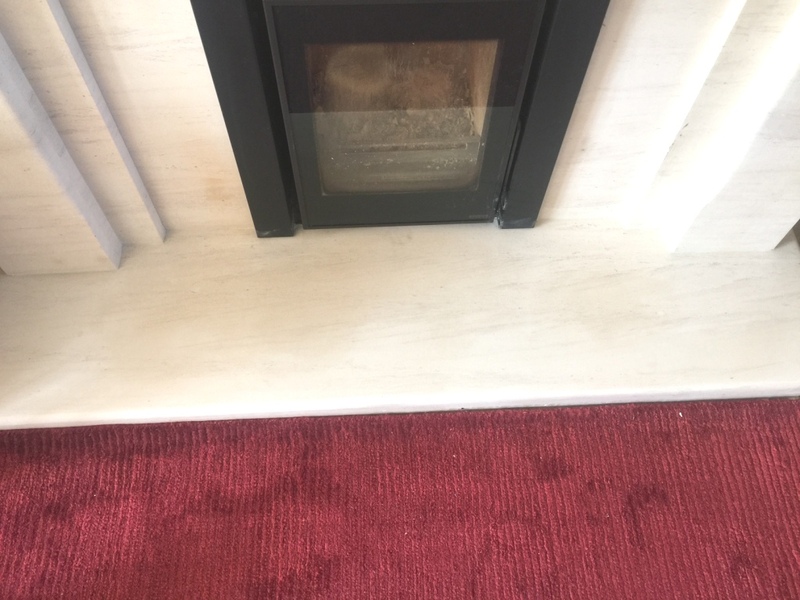 The sealer also enhanced the natural colours in the slate enhancing the look of the fireplace and the customer was very pleased with her new tiled fireplace with a robust seal in place she will not have to worry about its appearance becoming spoiled any time soon. The oldest properties often have the most interesting tiled features and this Quarry Tiled Fireplace was a fine example. 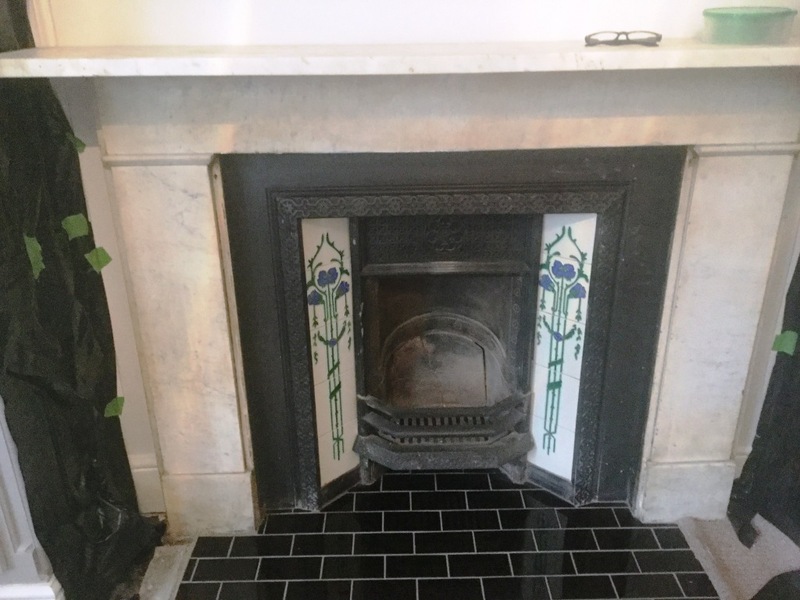 The customer lived in a quaint old cottage just outside the main town centre of Bedford and contacted us about restoring their fantastic Quarry tiled fireplace. While the customer knew that the cottage itself was over 200 years old, they had no idea whether or not the fireplace is an original feature. 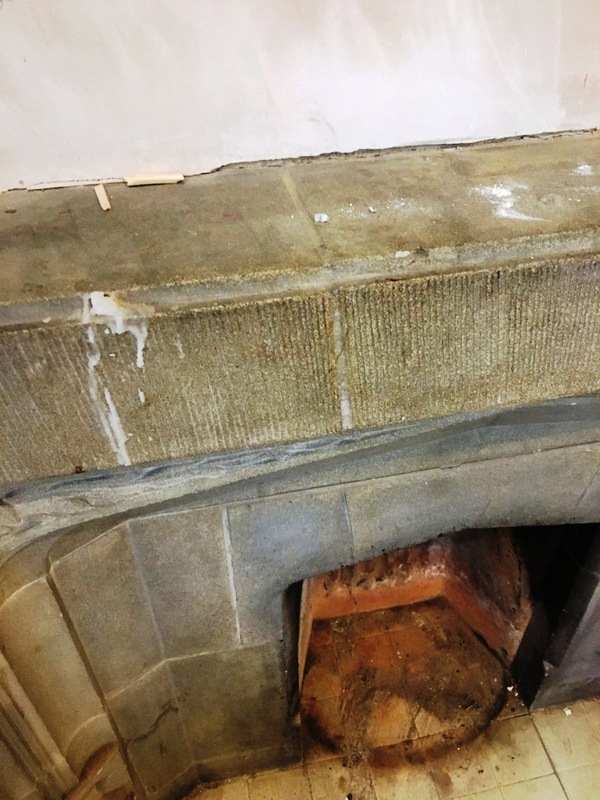 However, it’s safe to say that the fireplace is very old in its own right, and that it had been a long time since it had experienced any kind of professional maintenance. It goes without saying that as any kind of tiles get older they will need more frequent care to keep them looking at their best. Here, the Quarry tiles desperately needed cleaning up as they were covered in old candle wax and what looked to be several years’ worth of general dirt. This had significant dulled the natural shades in the stone, leaving it looking lifeless and unappealing. The tiles would also require a fresh seal to ensure protection against muck in the future, and to help restore the colour to the stone. Firstly, I applied Tile Doctor Oxy-Gel tile cleaner, which is particularly effective on tricky areas as being in a gel form it adheres better to non-horizontal areas. It was left it to dwell on the tiles for around twenty minutes so it could penetrate into the pores and get to work lifting out and dissolving the dirt that had been trapped in there over the years . Oxy-Gel is suitable for use on a wide range of natural stone tiles, including Quarry, Travertine and Slate. In this situation it cut through and removed most of the candlewax quite easily, and softened the stubborn residue to a point where I could easily remove the rest manually with handheld scrappers. I then left area it to dry, with an air mover installed to reduce drying time. 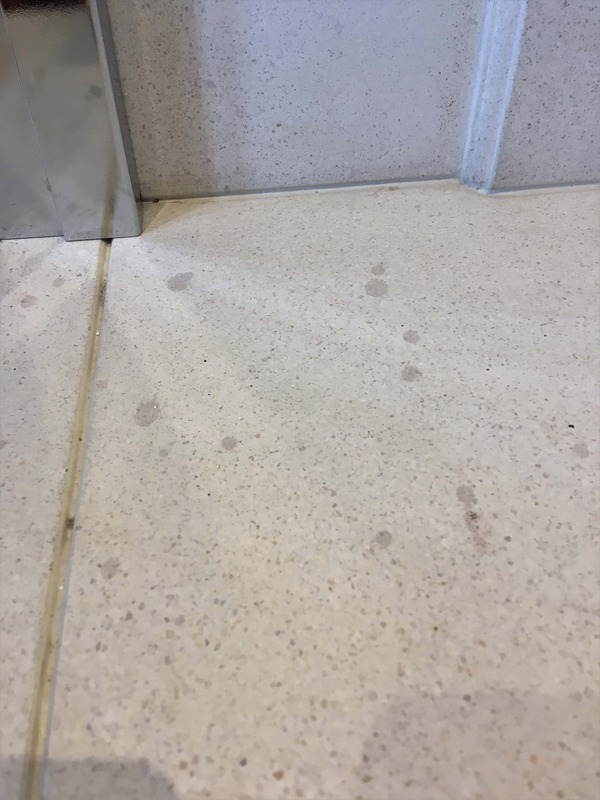 The advantage of using a gel product is that uses a smaller amount of moisture than a standard liquid cleaner, and therefore allows the tile to dry – and to be sealed – quicker; and in this case we were able to seal the same day where-as normally we would have to wait until the next day. 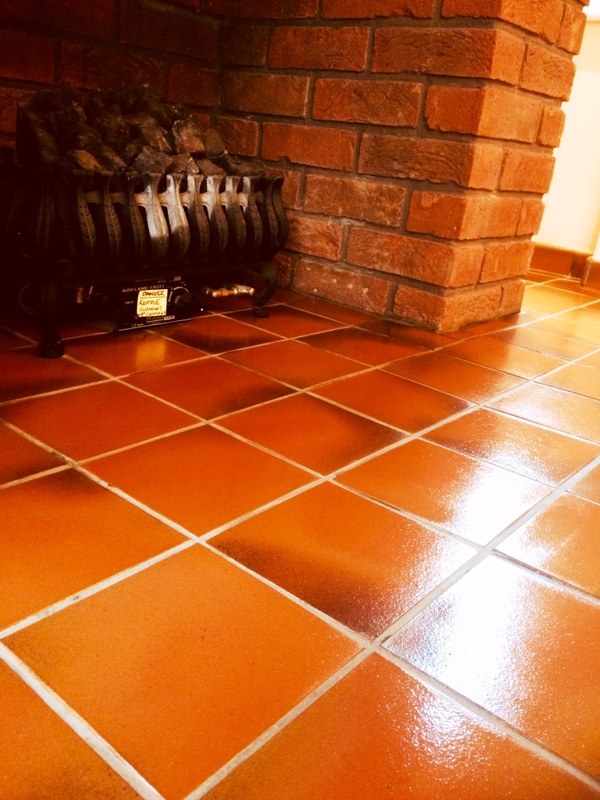 Once the tiles were completely dry, I sealed the fireplace with Tile Doctor Colour Grow which is an impregnating sealer that fills the pores of the stone to prevent dirt and general muck from becoming ingrained, making the tiles much easier to keep clean in the long-term. The added benefit of Colour Grow is that – as its name suggests – it emphasises the natural colours in the stone. This was something that the Quarry fireplace was desperately in need of, and the Colour a Grow quickly got the job done! The customer was very pleased with the finished results. The clean removed years’ worth of muck, while the fresh seal brought out the natural beauty in the Quarry tiles and, at the same time, will protect the tiles on future candle-lit evenings. 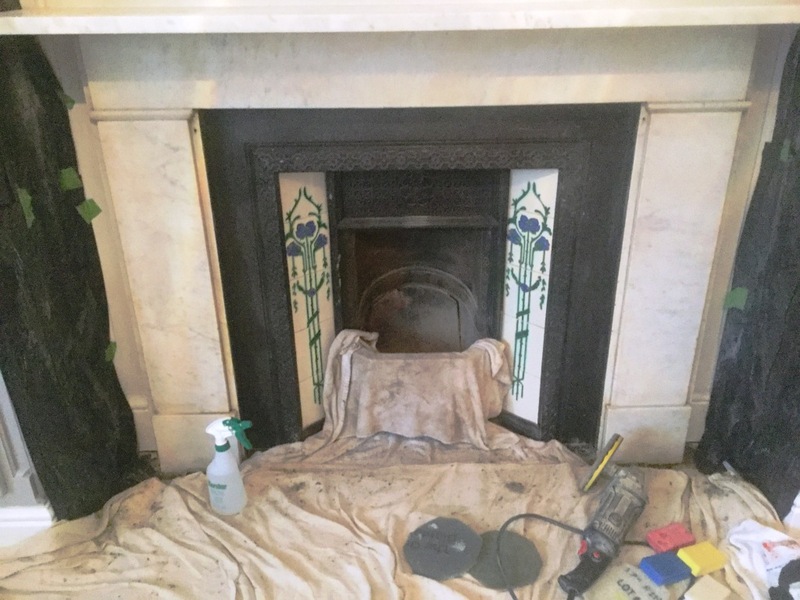 We don’t get a great deal of inquiries about the restoration of stone fireplaces so its refreshing when one comes along, however the principles of cleaning and are the same so were always happy to take on the work. 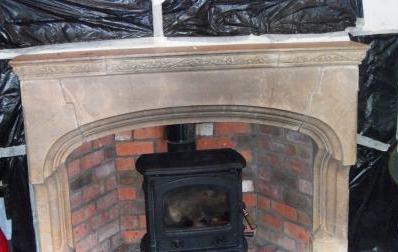 As you can see from the photograph above the Sandstone Fireplace was stained from soot and in need of a good clean. 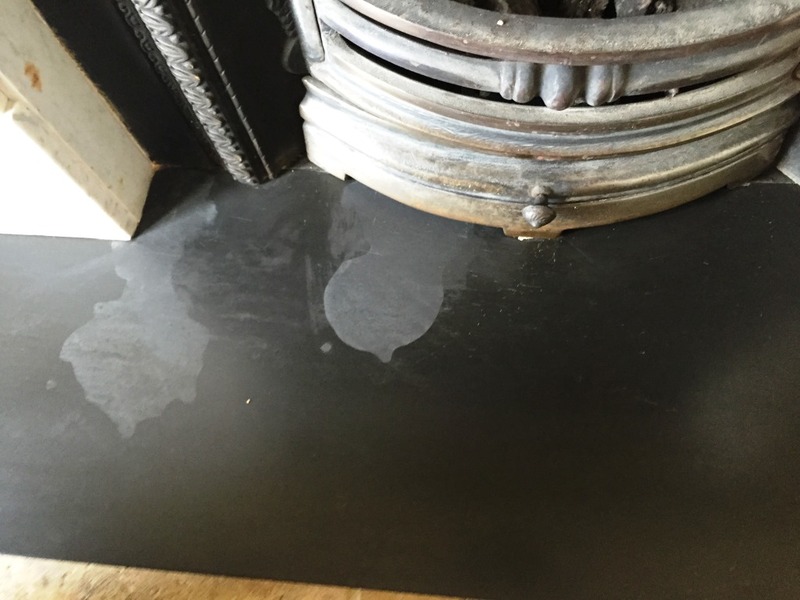 Soot staining is inevitable given the location however it can be reduced with wood burning stoves by fully opening the air vents shortly before opening the door, this reduces the amount of soot carrying gasses being released upwards and onto the stone when the opening. Before cleaning the Fireplace we protected the surrounding walls using black plastic secured with decorator’s masking tape. The next step was to mix up a 50/50 solution of Tile Doctor Pro-Clean and Ultra-Clean which was decanted into a spray bottle and sprayed directly onto the stone. Pro-Clean is a heavy duty cleaner and stripper whilst Nano-Clean contains abrasive particles so together they form a useful cleaning product. The spray mixes the cleaning solution with air which makes it lighter and more able to stick to vertical surfaces. The cleaning solution was left to dwell on the limestone for 15 minutes, then scrubbed and rinsed. The final step was to seal the fireplace with Tile Doctor Colour Grow which is a colour intensifying sealer that will provide stain protection going forward, I think you will agree the difference was amazing. 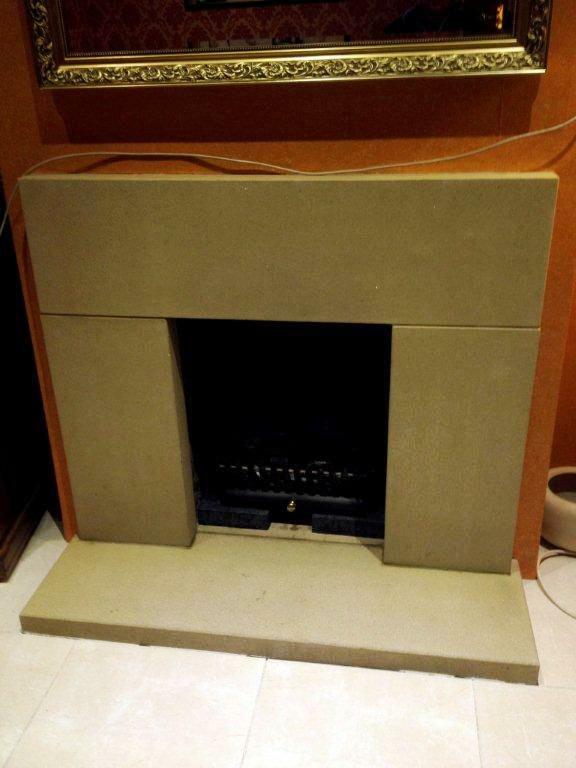 Details below of a Sandstone Fireplace surround from a house in Thame, Oxfordshire. 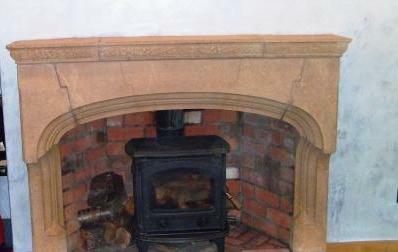 The fireplace had never been cleaned as the customer did not know where to start and so gave us a call. To clean the fireplace I used a diluted mixture of Tile Doctor Pro Clean and NanoTech Ultra Clean which combines the cleaning power of Pro-Clean with the tiny abrasive particles in Ultra Clean to produce a very effective cleaning product that is safe to use on Stone. This was left to dwell on the stone for a short while in order to let it soak in and work on the dirt before scrubbing it into the Sandstone with a hand brush. 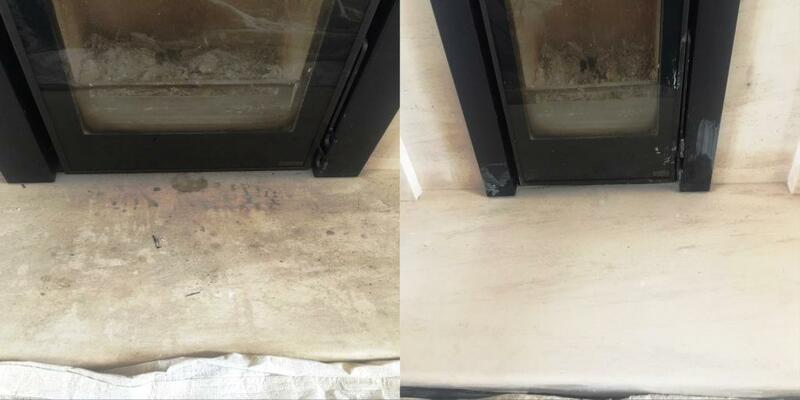 This process did a good job cleaning the stone and once I was happy with the result the soiled cleaning solution was removed using a wet vacuum and the stone was rinsed with water to make sure all the chemical had been removed. When dry the Sandstone was sealed using a couple of coats of Tile Doctor Colour Grow which will protect the stone going forward as well as bringing out the deep colour in the stone. To finish the job off I removed the grate and cleaned it up using some grate black to make it look new again before putting it back; last step was to remove the protective strip I had put around the fireplace to protect the wall and carpet and the job was done. As you can imagine the customer was quite surprised by the results and hadn’t realised what a wonderful fireplace they had until now. I thought you might find this post interesting as it’s a little unusual. 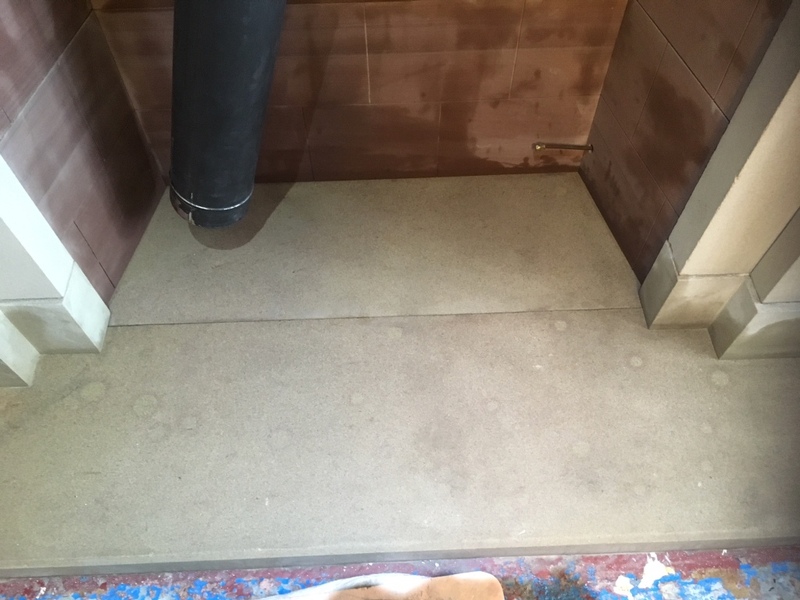 I had arrived at a client’s house in Boars Hill near Oxford to do a travertine floor and she asked if I could also take a look at her fireplace where one of her dogs had urinated on it. 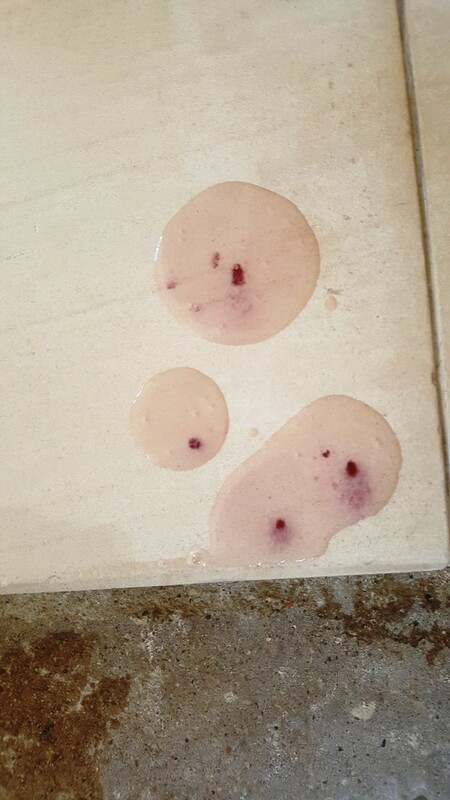 Urine is acidic so if not quickly removed it will start to eat away a sealer and in this case as you can see from the photo below it left a mark. It was quite a small area and as I already had the necessary products to deal with it I said no problem. The urine had penetrated the existing protective seal so to get a uniform appearance it was going to be necessary to remove the covering and re-seal. To do this I covered the hearth in Tile Doctor Remove and Go which is a tile and stone friendly product for removing of protective coatings. This was carefully scrubbed into the stone and bit by bit the old wax/seal was removed exposing the bare slate. The stripped slate was now clean and all trace of previous sealer had been removed but once it had fully dried was left looking washed out. This was easily remedied however by applying a coat of Tile Doctor Stone Oil which brought back the deep black colour. When the Stone Oil had dried I finished the job off by applying a coat of Tile Doctor Ultra Seal which is a natural look sealer that will protect the slate going forward.